Hundreds of mountain goats in Olympic National Park, WA have become so addicted to the salt found in human urine and sweat that they are an aggressive menace to national park visitors, charging at hikers and trampling vegetation. They have a taste for salt and minerals in human urine, and sweat on clothes and backpacks, according to officials. The solution to this problem? Airlift 375 of the non-native grumpy animals to more remote areas closer to their natural habitat where they will be less of a nuisance. The goal of the relocation is to transport 100 goats by September 24, and the rest within the next 12-months. Authorities said they expected to shoot another 300 or so that cannot be caught. 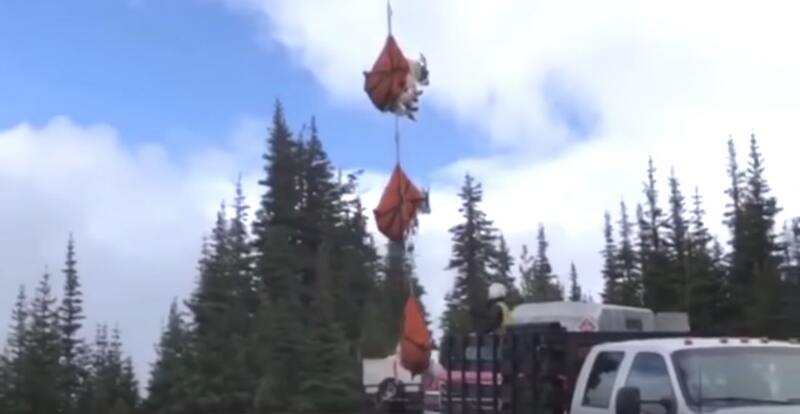 The operation began last week, when crews equipped with tranquiliser darts and nets captured goats from ridges and rocks within the park before being airlifted to a staging area, driven to another part of the North Cascades, and then airlifted in crates before being released back into the wild. Park officials urged walkers not to urinate along trails, to avoid turning paths into “long, linear salt licks” and attracting goats. In 2010, a 63-year-old walker bled to death after being gored by a 370-pound male mountain goat. It had followed within five or six feet of him for as much as a mile, according to rangers at the time. Wouldn’t it make more sense to drop some mineral licks into the areas away from the human trail use to give them the nutrients they require and stop them being a nuisance? They must be pretty desperate if they’re resorting to drinking or licking up urine traces! you mean use some commons sense? I use to raise goats. They loved their mineral blocks. If the mountain goats are having to resort to finding minerals in urine and human sweat, then the rest of the park is in serious trouble, and that includes the deer, elk, bears, and big cats. Absolutely agree- salt blocks away from trails is commonsense- clearly the humans involved are lacking this basic thought process! First: Urine has very specific aromatic compounds and these are specific to species and in fact down to the individual (ask your dog)lol. The sheep become addicted to that specific aromatic profile. Salt itself has no smell, as i aim sure you are aware of. second: Placing salt licks will also attract other animals, causing disruption in the natural balance and dependence on human interaction. Third these mountain goats are not indigenous to the olympic peninsula. they are moving Back to were they came from, north cascades . They are taking them home. They are being removed because they are not native and destroying everything, and relocated to the cascade range where they are native. The salt issue is really minor. I raise goats (Boer-Nubian crosses, so, big ones) and although it would SEEM like common sense to put out goat licks, knowing my goats they would not switch over but would embrace the power of ‘and’. They would continue to menace hikers, whether or not those hikers urinated in the park (because they like sweat too, remember?) AND take advantage of any salt licks around. It’s not always ‘desperation’ that drives a goat to do something. My goats are not ‘desperately’ hungry when they topple my fence to get at my apple trees. They see it, they smell it, they want it, they take it. Thankfully my buck (240 pounds of him) is relatively gentle, but he sees nothing wrong with pushing past me or through me to get at what he wants, so it pays to respect the power of the animal at all times and stay out of his way when it’s time to grain, or hay, or whatever. (He and I do have a bit of fun playing tug-of-war with various tools and things I use in the yard, but this isn’t something I encourage, since it’s potentially dangerous. It’s only pure luck that it hasn’t turned into a hazard!) In this case, respecting the power of the animal means relocating them so that they don’t kill anyone else or create such an impact on the region, which includes competing with our native animals. Their time in the park has run its course. Time for them to go. They are not that bright Sarah. It’s just because it’s salty. Most animals are attracted to salty substances. Hell. Dogs and cats are known for it. So do you really think a goats going to be any smarter. This whole thing tastes of devil worship. I blame that she-devil, Urinena. This whole thing feels like some obscure parody. This feels like a comedic statement about the levels of how low men will go to be with or near women. All hail the female Master Race. All hail feminism. what on earth does your comment have to do with goats? Put down the crack pipe, Ms Lee. Whether your comment is supporting of attacking feminism, it still has nothing to do with this article. The goats were introduced into the park decades ago and the managers have been trying to deal with their population explosion, which has caused habitat loss, erosion, and of course tragedy in 2010. As land managers, in particular, wilderness managers, invasive species have to go. This is how the park plans to restore some ecologic balance to the lands they are charged to protect (see Wilderness Act of 1964). Flying them out seemed more humane instead of shooting them all en masse. As for the salt lick blocks – cute idea, but it does nothing to reduce their population and destructive impact on sensitive high alpine vegetation. It’s hilarious, true. But there is a reason for the circus. They are only killing the ones that can’t be captured. 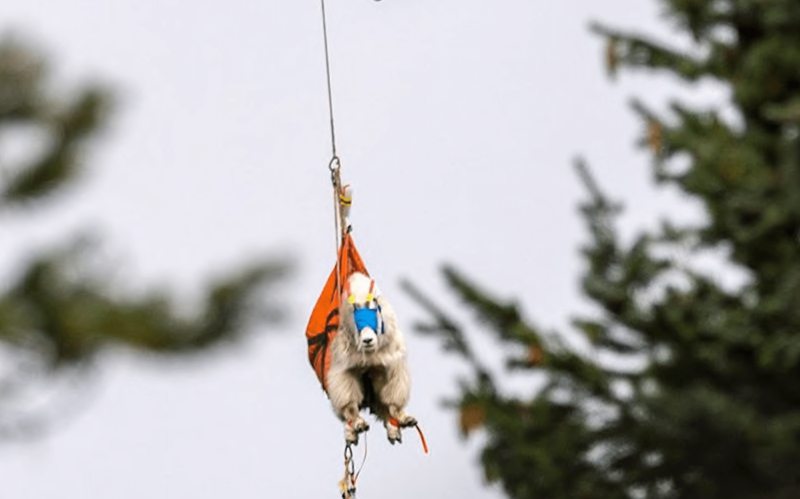 These animals are living on sheer cliff faces and some are going to evade trappers, or hang out places where darting them with tranquilizer would cause inhumane death or injuries from falling off a cliff. Oh yeah only men take a piss while hiking…. Would you fine them for sweating also? That’s the other thing the article mentions the goats were after. If the goal is to relocate or kill the ones that spend time on the trail, licking up salty urine (and I’m not taking issue with that goal), why are they going after goats that spend their time on inaccessible cliff faces? Because they are not native to that mountain range, and are decimating the vegetation there because those plants are not adapted to mountain goats feasting on them. The whole point of removing them from the park is to get rid of a non native species. The urine issue is just a tiny part, but it makes an interesting headline.